There are particular stores in Havana to chose from. In some, you will find arts and crafts made by hand. Others are better sorted than the Cuban outlet of Adidas or Zara. This is the case with the “shopping” establishment of Rufino, age 45 and retired because of an illness. In his house he sells everything. In fact, he even orders things. His wife receives you in their living room with a Colgate smile. She’ll lead you to a spacious and well-ventilated room where there is a closet that takes up an entire wall. In it, hang numerous articles of clothing. In a mahogany shoe-rack there are over two dozen pairs of shoes. For all preferences, too. Nike, Adidas, New Balance. There are even leather Italian and Brazilian shoes. There are even Guess and Levi shirts and jeans. There are Lacoste shirts and Mango dresses. Without ever letting her smile fade, the lady then shows us another room where there is a wide range of toys and electric appliances. “Always cheaper than the store,” she tells us. In the patio of the house they display hardware supplies. 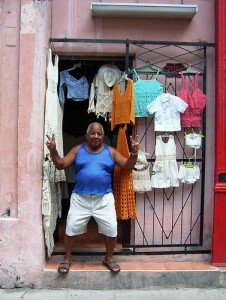 In his square shorts and Hawaiian sandals, the owner of the illegal shop, Rufino, asks us if we are satisfied. This kind of private store, without authorization from the government, has surged throughout the entire capital during the last few years. They compete in price with the State stores and many times they are better in quality. Ernesto, 39, also dedicates himself to the pacotilla business. He is a man who speaks well and is smart. He graduated in History, but his degree resides in a drawer somewhere in his room. “Pacotilla,” in the singular, is what Cubans call one or more cheap merchandise articles. Many times they are copies of name brand products, a field where the Chinese are specialists. Since 1992, the allocation of industrial products on the ration book disappeared and so too did the practice of Father State yearly granting each Cuban citizen a pair of shoes and two articles of clothing; now Cubans had to find their way however they could. And if you want to be trendy, you have to have lots of cash. But they get their hands on it. Especially in Havana, where the majority of young kids want to go about dressed similar to those in any other Western city. They want to carry their iPods, iPphones, Motorola cells, etc. It’s known that the money necessary to purchase pacotilla mostly comes from all the financial assistance sent to Cubans by families in exile, especially those in the US. Lots of the money also comes from prostitution. With hard currency, prostitutes spend crazy amounts on clothes, shoes, and perfume. In 1993 the dollar was legalized. Since then, variety stores, commonly known as “shoppings”, sprouted up throughout the country selling pacotilla by weight For an even more select club, boutiques were created with sky-rocketing prices. Similarly, in the clandestine market a handful of people are dedicated to buying and selling clothes, shoes, perfumes, jewelry, toys, and even computers and plasma TVs, began to appear. Thanks to massive collaboration of doctors, teachers, and sports trainers in Bolivia, Ecuador, and Venezuela (amongst other countries), a good number of those who are carrying out “solidary missions” from the strict salary that the Cuban government pays them, they save money and acquire pacotilla in significant amounts. Later, they sell them when they return to the island. Rene, 32, is a lucky guy. He is the auditor of a company which does business with Venezuela and he travels to South American countries four times a year. When he is in Cuba he buys dollars in bulk, at 0.92 cents U.S. for each Cuban Convertible Peso (CUC). He pays better than the state offices; they give 0.80 cents U.S for one CUC. He always leaves for Caracas with at least 3 to 4 thousand dollars in his Samsonite suitcase. He uses nearly all of it to purchase pacotilla in commercial centers in the capital of Venezuela. Business has not been bad for Rene. He has been able to repair his house and is even thinking of buying an American car from the 50’s. Truth be told, his pacotilla share the quality of those sold by Rufino, whose slogan is “good, pretty, and cheap.” Even though the “cheap” part will be determined as time goes on. Author Translating CubaPosted on July 2, 2010 Categories Ivan Garcia, Translator: Raul G.